The final part of the Narrow Dog trilogy sees pensioners Terry and Monica Darlington and their two whippets heading north on their latest boating adventure. Their previous tales took them across the Channel to France (Narrow Dog to Carcassone) and through America (Narrow Dog to Indian River). All three of these books are beautifully written and witty affairs. At worst you could call them whimsical. In Narrow Dog to Wigan Pier we follow this eccentric bunch on their new boat the Phyllis May 2 (the original Phyllis May canal boat having perished in a fire) as they sail to Liverpool, Lancaster, York, the Pennines and finally to Wigan Pier. Alongside the journey, Terry records the story of his life, marriage and his two whippets Jim and Jess. Jim is a whippet who can run at 40mph but is cowardly, steals and has a “broken ear like a flat cap.” New addition Jess is more affectionate than Jim but is also a coward and really hates being on the boat. Terry also recalls his globe-trotting adventures and has many a hilarious anecdote about the famous and fascinating people he has met. Brilliant stories from the multinational business he built up to how he started a marathon running club for the over 60s. His escapades and voyages down the years are gentle but engaging and laugh out loud in places. 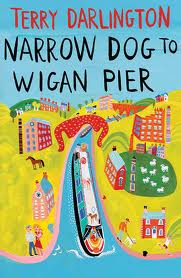 The Darlingtons are thoroughly loved up and down the British waterways and it’s no surprise to fans like me that the Narrow Dog series have together sold nearly a quarter of a million copies. Immense fun, a really good travelogue and memoir.